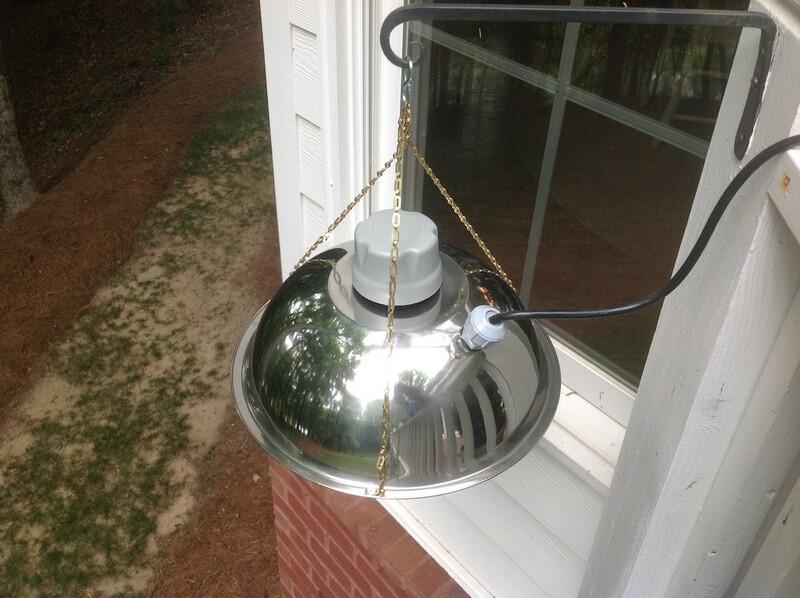 PRODUCT DESCRIPTION: Dome shaped light fixture which has a motor and weed whacker type line that kills insects when they fly toward the light. It comes with a "photo sensor" so it only runs when its dark out. Hang this light outside on patios, porches, decks or just in the yard to control flying insects that are attracted to light. These can also be hung on boat docks at any pond or lake and will provide all natural food for the local fish. The trap comes with everything you need including the two light bulbs seen in the picture to the right. These are low voltage bulbs (23 watts) so their energy consumption is low. But they attract a wide range of moths, beetles, european hornets, toe biters (giant water bugs) and more. Basically the rotating line will "chop" up any insect that comes close. The fan has four arms to which heavy monofilament is attached – much like a weed whacker. This line is thick and will last forever but may require some cleaning 1-2 a year depending on how many insect pests you kill during the warm season. The dead insects can either be collected for cleanup or the light can be positioned over an area where the bugs can be left for "mulching". WHERE TO USE IT: This trap does require 110 volts so you'll need a power outlet close to the install (standard outlet for plug in). Common locations where they may be deployed include decks, patios, alongside a doorway, garages, picnic areas, camp grounds, boat docks, gazebos and just about any place outside where flying insects are a problem during the night because they are attracted to light. RATE OF APPLICATION: One trap per 1/2 acre. Comes with a 2 year warranty. Does the fly trap come with any kind of warranty? It does. I just noticed the description above didn't show the warranty so we've added it. Basically its covered for 2 years from your date of purchase. But in our experience, as long as you keep the spinning mono clean and make sure to remove bug "debris" that can sometimes build up around the outer edges of the dome cover, these units will function for 5-10 years no problem. And mind you clean up is only needed every few months so overall its very easy to maintain. Just plug it in and make sure the light bulbs are good and you're set. Is this product OK in inclement weather (rain) ???? Oh yes. Its built to be rain proof and won't have any problems sitting out in the open. I am concerned that the flying insect trap will attract miller moths to my yard that otherwise would not invade my property. Can you comment? 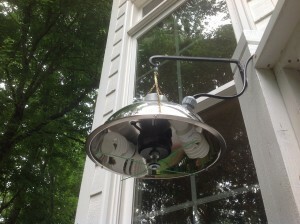 First, though miller moths would be attracted, they would be killed like any other night time pest attracted to light. In fact we sell these for people with miller moths who want a way to reduce the population around the yard and in no case does it lead to more. Second, miller moths won't notice it unless they're within 1/2 acre anyway so in most cases, if any do notice it, they will be moths already on your property and not "new" ones. In summary, installing one of these will not lead to more being around and if anything, the trap would help decrease the activity on your property. Give us a call if you have more questions or concerns.